A new Phillip Jeffries wallcovering is always an event. Ten new Phillip Jeffries updates registers as a mega-event! 'The House of Naturals' gains three updates (Juicy Jute II, Shoreline Grass, St. Bart’s Serenity); 'The Passport Collection' updates with Agate; 'Simply Seamless' has two additions (Cabana Weave, Chevron Chic II); and 'Tailored Walls' grows by four collections (Malibu Knits, Nantucket Yarns & Cloth, Seaside Linen, Silk & Abaca II). About PHILLIP JEFFRIES - Now in its fourth decade, Phillip Jeffries has emerged as the industry leader in hand crafted wallcoverings. A manufacturer and importer of unique and fine quality textured wallcoverings, the company was founded in 1976 by Chairman, Eric Bershad, with just 10 grasscloths. 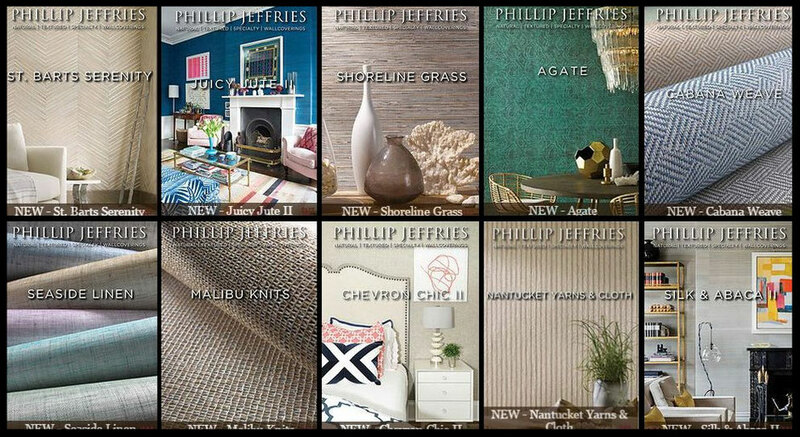 Today, Phillip Jeffries Ltd. stocks more than 1100 natural wallcoverings including Japanese Paper Weaves, Gold Leaf, Grasscloth, Hemps, Silks, Linens, Granite, and Raffia as well as many unique hand crafted specialties. Eric’s passion for wallcovering excellence continues to live on in the next generation of Phillip Jeffries Ltd., through his sons Philip and Jeffrey Bershad. Headquartered in Fairfield, New Jersey, Phillip Jeffries Ltd. partner with skilled artisans and craftsman to create the design world’s most beautiful and sought-after wallcoverings. From New York based Collins & Company, antique silvers and golds shimmer, saturated blues delight and smoky creams swirl in misty clouds and deco-inspired lines crisscross in geometric designs. About COLLINS & COMPANY - Collins & Company has an experienced design and print staff that uses a blend of modern and traditional print techniques to produce one of the widest ranges of designs in the industry. The range of their expertise includes rotary & flat silk screen printing, antique surface printing, precise gravure printing, repeat-less digital printing and textile string pattern application. Designs can be printed on various classes of paper, non-woven, grasscloth and cork using many kinds of environmentally sensitive inks. Serving the New York and international wallpaper design community, Collins & Company’s materials are sourced with a concern for their impact on the environment. Paper-based designs are only printed on pulp sourced from certified and well-managed forests. They rely solely on water based ink that can be easily filtered after the production processes. Creamy bricks, standing birch trees, cool metal rivets and smoky swirls inspire inventive designs in Mayflower's new collection, Solaris. About MAYFLOWER - Launched by designer Jonathan Caldwell, Mayflower is his journey into a new world of design. Jonathan was born in the UK to a family steeped in the tradition of Art and Design. He trained as a contemporary fine artist at Chelsea School of Art in London. His passion for Art, music and the great outdoors gives him endless inspiration for design and colour. A few years ago he moved, with his three sons, from the UK to Providence, Rhode Island, USA. Hence the decision to call his new company Mayflower, in reference to the spirit of adventure that Jonathan maintains in his work as well as in his personal life. The symbol - the compass rose - on the cover of all the books shows the USA in the West and the UK in the East. 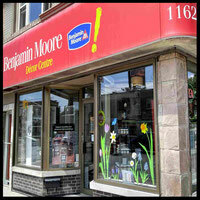 We look forward to you visiting us at Upper Village Paint & Wallpaper (1162 Eglinton Ave W) or call 647-352-6119. Let us help you explore exciting possibilities in wallcovering! Other 2017 Wallpaper Collection releases can be found here.